Roland’s new M-5000 Live Mixing Console. Roland’s new M-5000 Live Mixing Console, pictured with the interface for the free downloaded remote control software. 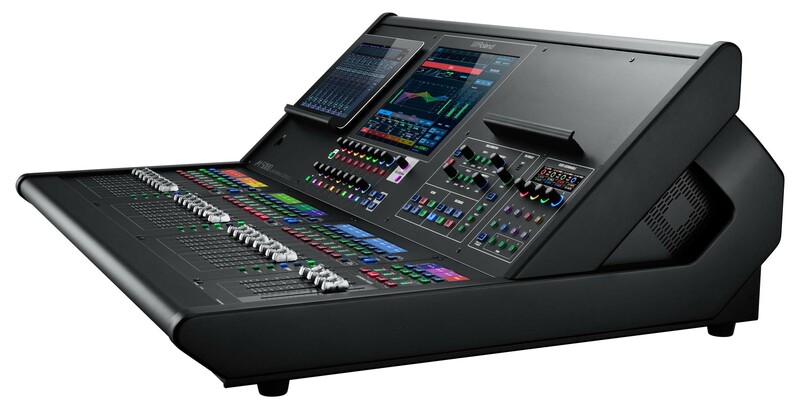 Los Angeles, CA., April 27, 2015 – Roland’s Professional A/V division announces the availability of the brand new Roland M-5000 Live Mixing Console based on the O.H.R.C.A platform. A celebration was held at the Miyakoda Factory in Hamamatsu, Japan, a few days prior to shipping as the first M-5000 Live Mixing Consoles were delivered off of the assembly line. Mr. Ace Yukawa, President, and Mr. Hinori Kato, Global Sales Manager for Roland Professional Group, were on hand for the celebration. The Roland M-5000 live digital console goes through extensive testing before leaving the factory to the market. Each product undergoes rigorous tests, including vibration, drop, environmental, temperature and humidity, before it leaves the factory. The final test is a “4-week” aging test, which requires the M-5000 to be powered on continuously for four weeks straight. According to Takahashi and his team, if a unit fails any test along the way, it can’t move to the next process. Only products that have passed the strict criteria will reach the customer’s hands. A video of the M-5000 production and quality assurance testing can be seen at https://youtu.be/Q1lk6ucrth0. The M-5000 and the extensive list of components and accessories including digital snakes, personal mixing, expansion cards and multi-channel recording options are available for sale through Roland’s Professional A/V M-5000 Series resellers. For a list of resellers in your area, please contact them at proavsales@rolandus.com, or by phone 800-380-2580. For more information on the Roland M-5000, visit http://proAV.roland.com/OHRCA. The Roland M-5000 Live Mixing Console is the first product based on the O.H.R.C.A. platform, which opens a new generation of live sound solutions for audio professionals. “O.H.R.C.A.” stands for “Open,” “High Resolution,” and “Configurable Architecture,” and the M-5000 reflects this by delivering freely definable audio paths, supporting multiple audio formats protocols and offering pristine 96 kHz sound quality throughout the system. The Roland M-5000’s internal mix architecture is not fixed and can be freely defined for mixing channels, AUXs, Matrices, subgroup buses, and MIX-MINUS buses within a range of up to 128 audio paths, allowing users to create a console structure to suit the needs of the application. The M-5000 has two built-in REAC ports, plus two expansion card slots with seven expansion card option including Dante™, MADI, Waves SoundGrid®, or more REAC ports, as well as future formats. The back panel includes 16x16 analog I/O, 4x4 AES/EBU, a 16x16 USB audio interface, connection for control via an iPad connected or wireless, and control ports including footswitches, GP I/O, RS-232C and MIDI. All of this capability enables the console to see up to 300 inputs and 296 outputs, all at 96kHz and even more at 48kHz. A flexible workflow is at the heart of O.H.R.C.A., and the M-5000 is very responsive. Control includes 12” color touch screen, 28 channel faders in four groups, anchor points, DCA spills, multifunction knobs and buttons, and a user assignable section. Full functioning remote control software (Mac/Windows) extends the user interface beyond the built-in GUI, resulting in flexible organization of critical pages or meters on external monitors. Pristine 96 kHz audio with world-class mic pre’s built into the console, as well as Roland’s extensive digital snake lineup, ensures the highest quality of sound end to end. Effects include 4-band PEQs; eight stereo multi-effect processors of Roland classic vintage and famous BOSS compact pedals; and thirty-two 31-band Graphic EQs. Mains can be configured for 5.1, LCR, and LR, plus surround panning and stereo downmix. The extensive family of Roland Pro Audio products, such as digital snakes, the M-48 personal mixing system and Roland R-1000 recording/playback products, works seamlessly with the new platform, an ideal upgrade for thousands of existing users. In the rapidly changing world of live sound, the ability to adapt on-the-fly to meet the needs of the application is sometimes the difference between a good show and a great show. The new M-5000 on the O.H.R.C.A. platform meets the demands that professionals now expect. Photo Caption 1: Roland’s new M-5000 Live Mixing Console. Photo Caption 2: Roland’s new M-5000 Live Mixing Console. Photo Caption 3: Roland’s new M-5000 Live Mixing Console. Photo Caption 4: Roland’s new M-5000 Live Mixing Console, pictured with the interface for the free downloaded remote control software.